You know what they say about March. “In like a lion, out like a lamb”. We thought this would be a good time to share some of our favorite comfort food recipes to get you through these last few weeks of winter. Here are some recipes for those days when you just want to feel a little nostalgic while eating a meal that almost rivals the ones mom used to make. Season all sides of the pot roast liberally with salt and pepper. In a large Dutch oven or slow cooker, add the onions, garlic, bay leaves, and wine. Next sprinkle in the Italian seasoning. Lay the pot roast in and add the peperoncini, red bell peppers, artichoke hearts, and sundried tomatoes. Add enough broth to cover everything in the pot. Pour the sauce into a saucepan and place on the stove on medium heat. In a small bowl combine the cornstarch and mix some hot cooking liquid in to create a smooth paste. Add cornstarch slurry to sauce and stir/whisk until smooth. Let the sauce simmer to thicken for a few minutes until desired consistency is reached. Re-season with salt and pepper to taste if necessary. 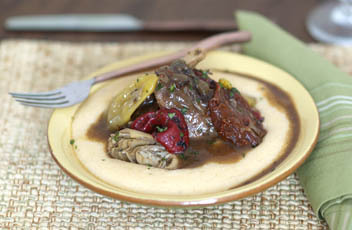 To serve, place the shredded meat, veggies and sauce over egg noodles, cheesy grits, creamy polenta, or mashed potatoes. In Milan, toasted cheese sandwiches are a popular gourmet treat. The cheese is laid over the artisan bread and then topped with olives, roasted peppers and herbs. The sandwich is closed, pressed tightly and browned on both sides with olive oil. This easy to make recipe is perfect for anyone in a time crunch. Mix the sliced olives and sliced roasted red peppers in a bowl with the garlic and cilantro or green onion. 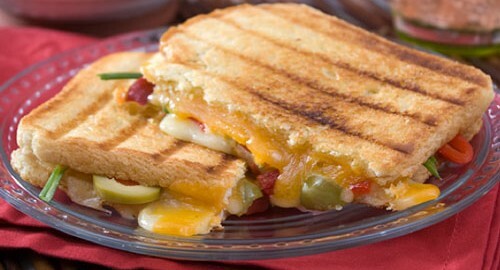 Sprinkle 4 slices of bread with half of the cheese and then top with pepper/olive mixture. Apply the remaining cheese as another layer. Top with a second piece of bread and press together. 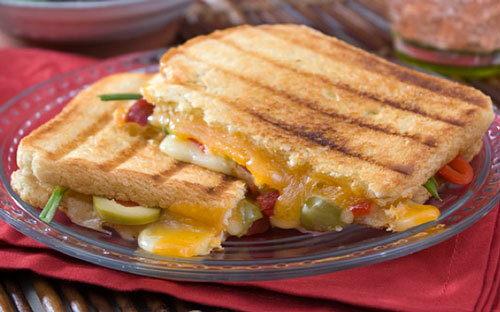 Use a Panini press or heat the olive oil in a skillet and gently brown the sandwiches, turning once or twice as the cheese melts and holds the bread together. Some of the cheese will ooze out and crisp in the skillet, which is delicious, even if it browns slightly. Place sandwiches on a napkin lined plate to absorb the excess cooking oils. Serve hot. Preheat oven to 425°F. In one bowl, mix eggs, buttermilk, milk and butter. Stir in jalapeños. In another bowl, mix flour, corn meal, baking powder, baking soda, cilantro and salt. Fold wet mixture into dry mixture. Pour into a buttered baking dish. Bake for 20 minutes. 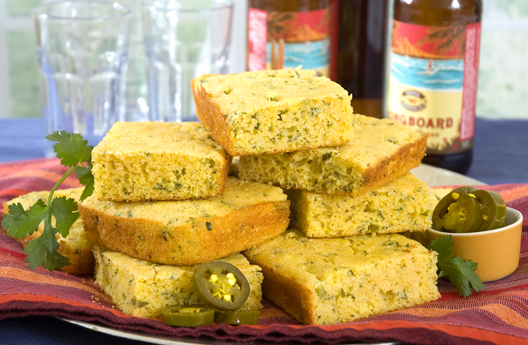 Rest and allow corn bread to cool. Cut into squares or wedges and serve with butter or a black pepper-flavored honey.